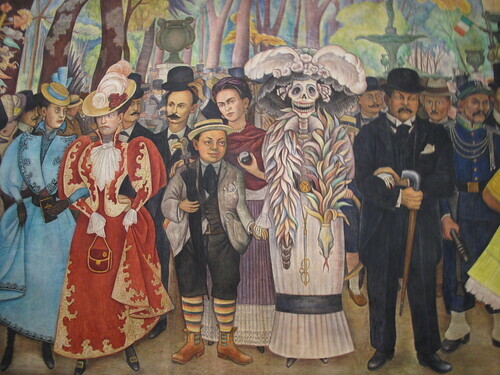 Aside from Frida Kahlo, probably the most famous Mexican artists are the great Muralists of the early 20th century. 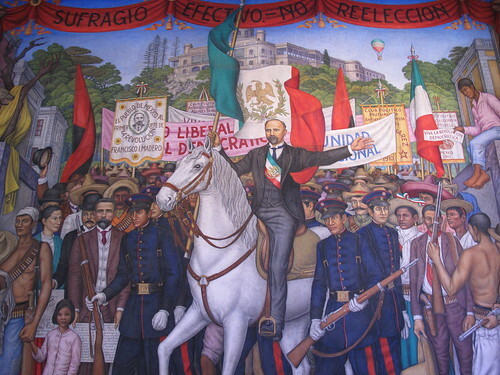 In the 1920s, soon after the Mexican revolution, the education minister commissioned various artists to create a series of public murals to increase awareness of the country’s history and cultures amongst the population, and to help build a unified sense of national identity. 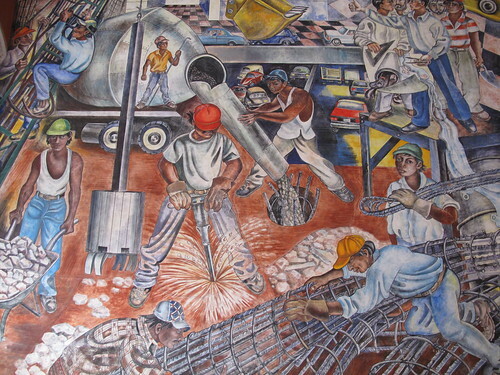 Many of the best works (by Diego Rivera, Frida Kahlo’s husband, and David Alvaro Siqueiros) have strongly left-wing message, including highlighting the past and ongoing repression of indigenous peoples. 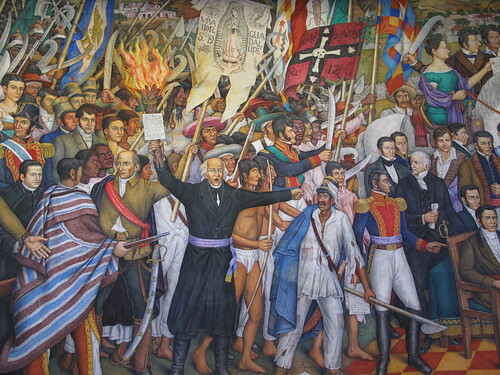 The movement spread across the country, and I saw examples in Mexico City, Aguascalientes, Guadalajara and Oaxaca, in various public buildings. Normally huge and often brightly coloured, they are a great way to learn a bit more about the country’s history. 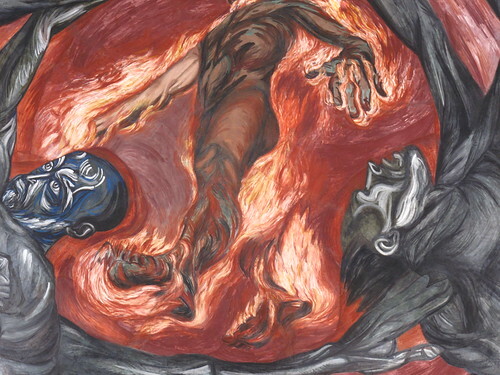 The ones by Jose Clemente Orozco in Guadalajara’s Instituto Cultural Cabañas are so impressive and historically important, they are now a World Heritage site. Here are pictures of some of my favourites. 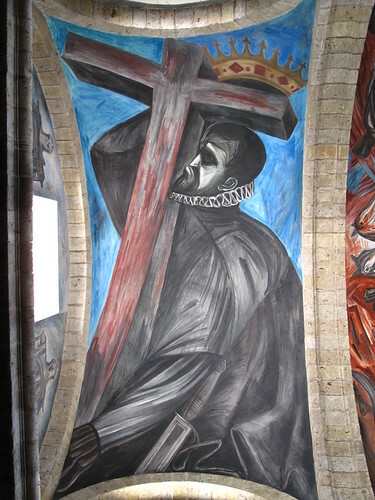 This entry was posted in Art & Architecture, Mexico and tagged Aguascalientes, blogsherpa, David Alvaro Siqueiros, Diego Rivera, guadalajara, Jose Clemente Orozco, Mexico, Mexico City, mural, murals, Oaxava, Orozco, photography, Rivera, Siqueiros, travel. Bookmark the permalink. You’ve just given me a good reason (art) to think more about Mexico as a travel destination. I like the first one with the skeleton in women’s clothing. And I finally saw the movie Frida this past January when I was couchsurfing in Bogota. She certainly had an unfortunate set of circumstances in life. There’s so much good art in Mexico, ranging from all the public art in the form of Murals, great art galleries in all the big cities, and really interesting indigenous art in many areas too. Beautiful! Our spanish teacher spent some time with us explaining some of the Latin American art and mural culture. It was fascinating to learn about the history of the culture through the art.